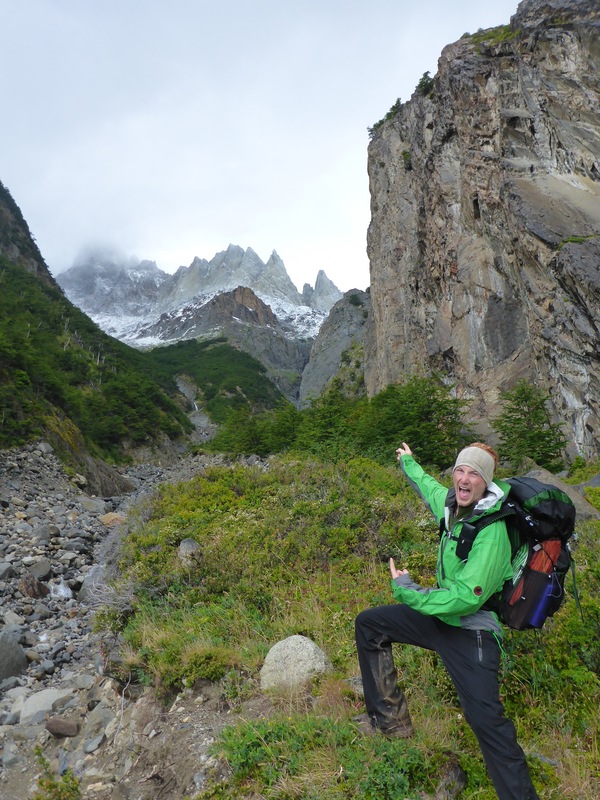 Torres del Paine: John Gardner Pass Summit Day! When the alarm went off at 6am it was accompanied by rain and lots of it. So we stayed in the tent hoping it would taper off. About 7 am it did and we quickly grabbed our stuff and decided it would be smart to pack our bag in the dry/warm cooking shelter… we weren’t the only ones with that idea. We quickly ate some breakfast, got our bags packed and discussed our plan to go over the pass with a couple of fellow hikers. One in particular, a search and rescuer from Oregon, warned us not to go, that the weather wasn’t great. A couple of others said they were waiting it out too. But we felt good, and Liz had eaten her “summit day apple”, that she had carried with her for the last 7 days, for breakfast, so we headed out for John Gardner Pass. We were moving really quickly, in the zone to get over the pass, and not ones to spend more time than necessary in the cold and rain. We passed two larger groups of trekkers as we made our way through the woods, and all the other people who had been in front of us. It was now raining quite a bit again. 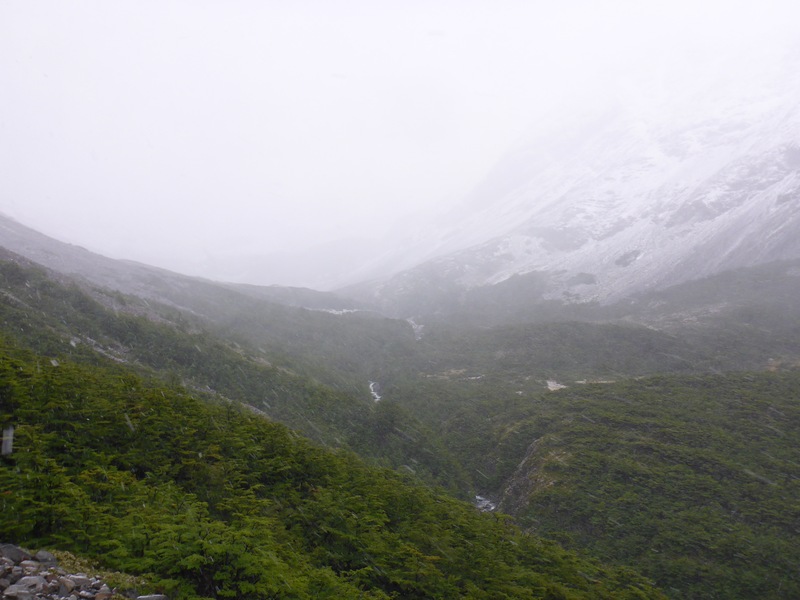 As we reached treeline we were feeling good and we could still see the trail in spite of the rain turning to snow. That was our rule for the pass, “If you can’t see the trail from treeline turn back.” We can see the trail, we’re feeling good and we’re moving quickly, we’ll be on the summit in no time! Above treeline the wind really starts to pick up. The snow is now blowing directly into our face. As the snow continues to dump and starts to stick in places, we realize most of the trail markers are spray-painted rocks, not an issue, unless they’re covered in snow. We’re now flowing the few cairns and poles that are spread along the trail. This begins to prove difficult as the wind and snow are making it near impossible to look uphill for more than a couple of seconds at a time and searching for the next trail marker is becoming a real challenge. We’ve lost the pep-in-our step we started the morning with and stopped taking pictures because our hands were freezing cold. We’ve now resorted to Liz hanging back at a trail marker while I go uphill looking for the next one then call for her to come up once I find it. We agree that if we don’t make it to the summit in the next 20 minutes, we have to turn back. But we knew we were getting close to the top of the pass when the wind started to accumulate the snow in drifts that went up higher than our knees. We fought through the deep snow for the last 50m of the climb, and just as we could see the summit we got a glimpse of blue sky as well. At the top the wind is the first thing to give away that we’ve arrived. It’s blowing so hard the snow can hardly stick (which resulted in the deep drifts we just climbed). We see a small rod with a Chilean flag and few other things attached to it we now know were at the top of John Gardner Pass and we’re elated! 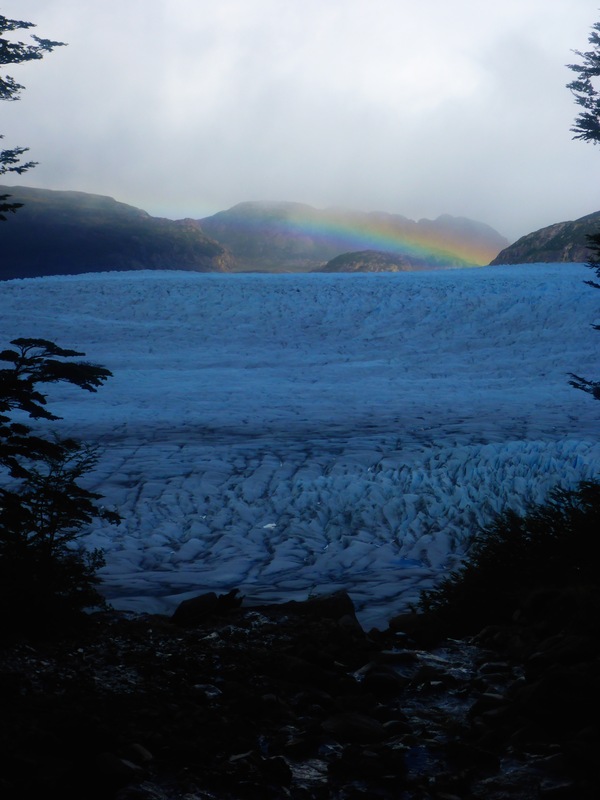 We snap a few pictures, smile at the small window of blue sky above us knowing that God spared us from disaster then we see the enormous Glacier Grey with a rainbow over it. 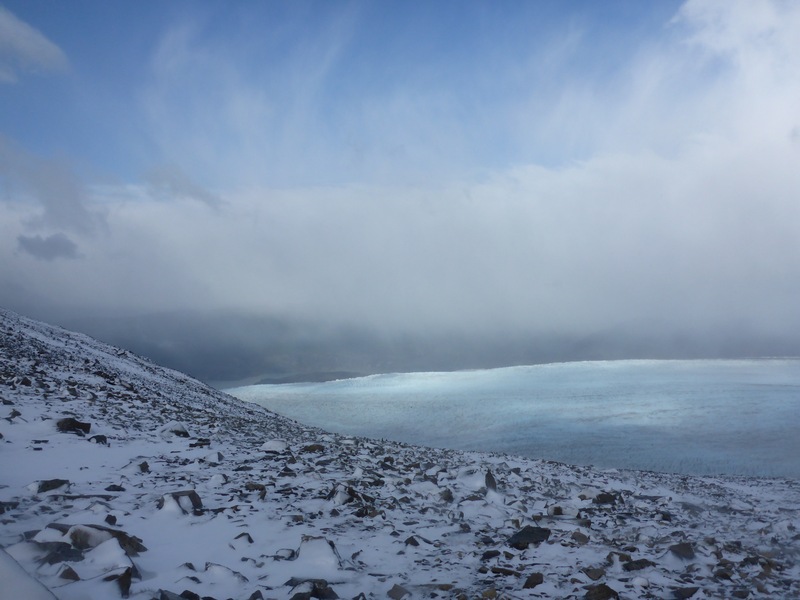 Glacier Grey is just a small part of the Southern Ice field but it goes on almost as far as you can see. 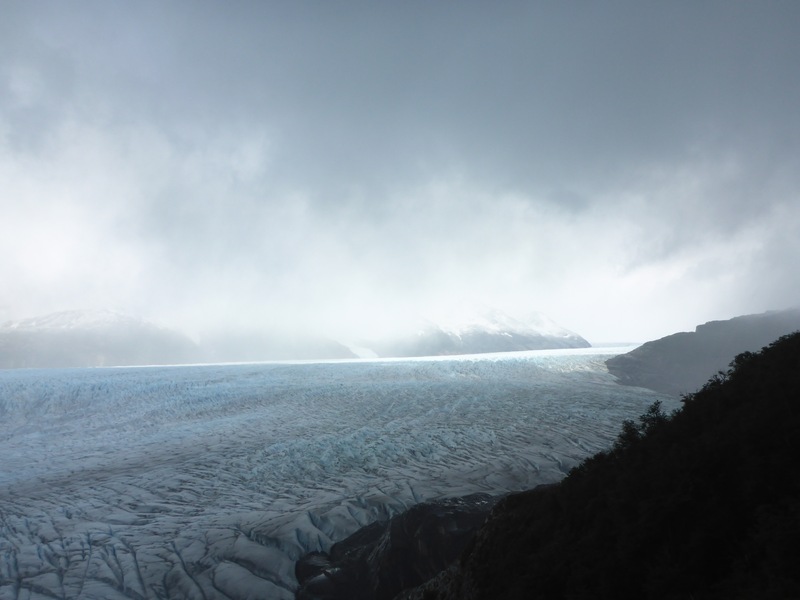 The ice field that its attached to is the second largest ice field in the entire world, after Antarctica. As you can imagine the wind coming off of this is COOOOOOLD! 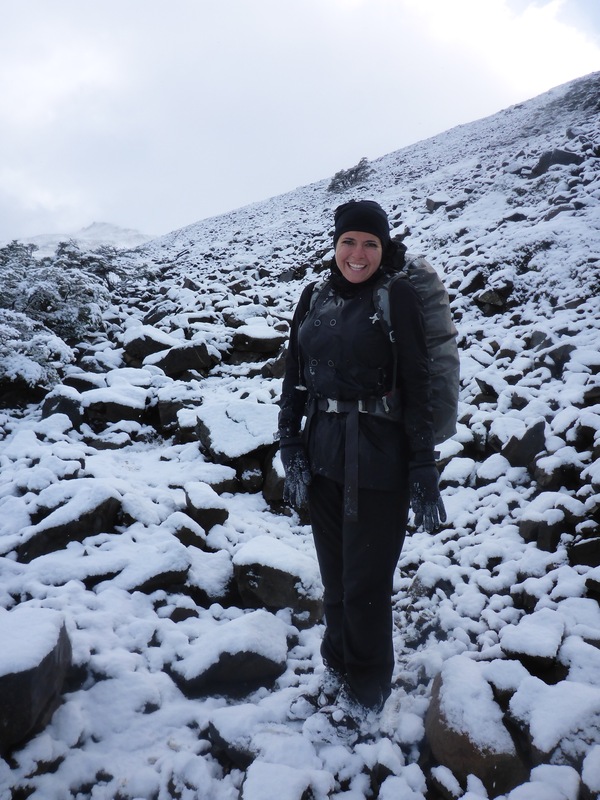 We are momentarily relieved to find that there’s no snow on west side of the pass just a lot of rain… and slippery mud! We skid and slide our way down to tree line then through the woods to Campamento Passo where we take a quick break and continue our decent. Shortly after we caught up with Brad who had taken a late start out of Paso that morning. 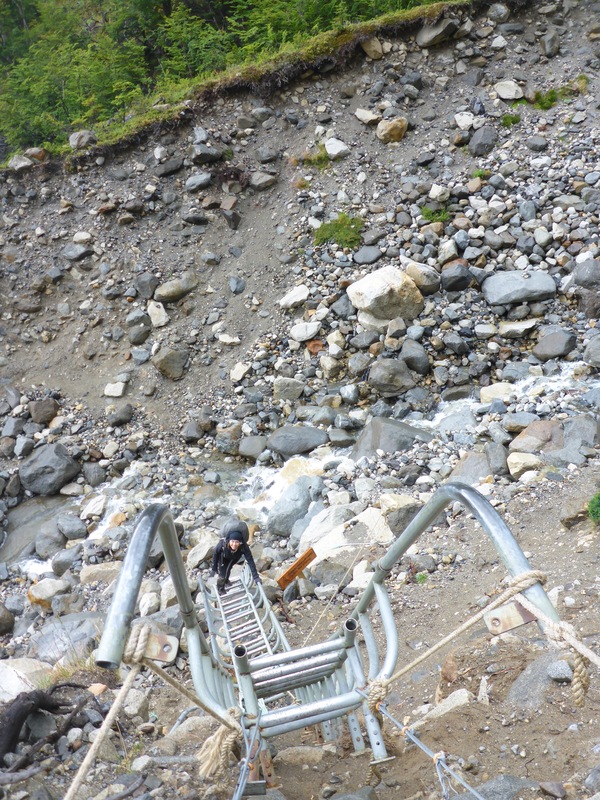 We climb some rickety ladders and a brand new bridge before reaching the end of Glacier Grey where it melts into Lago Grey and occasional calves an iceberg. 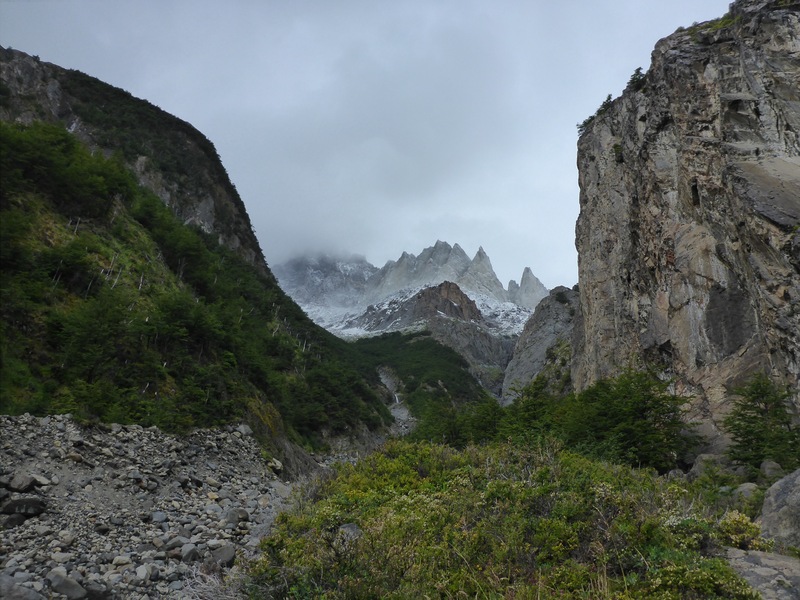 We make it to Refugio Grey, our goal for the day, with extremely sore bodies, blisters and plenty of daylight to make it down to Refugio Paine Grande. We decided if we stopped moving we wouldn’t be able to start again so we keep moving. 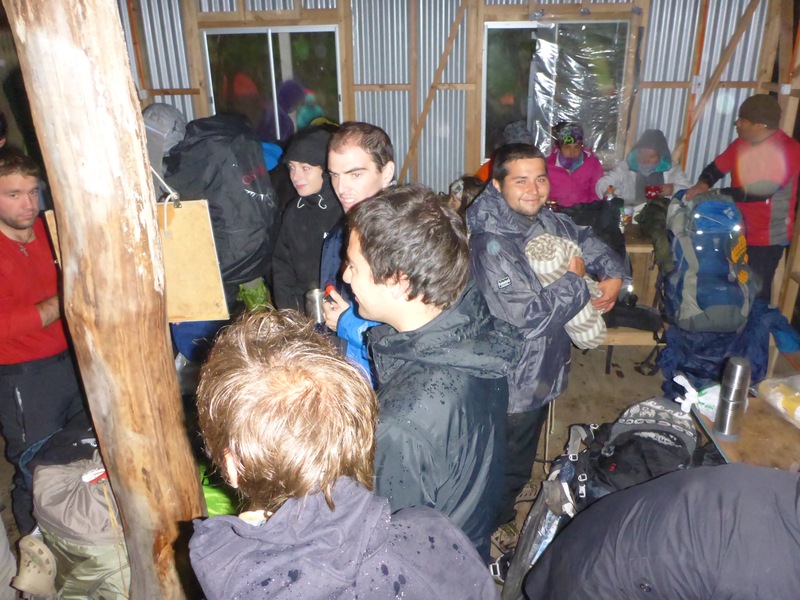 As we reached Paine Grande we saw Diego and Jacky who left Paso early that morning. 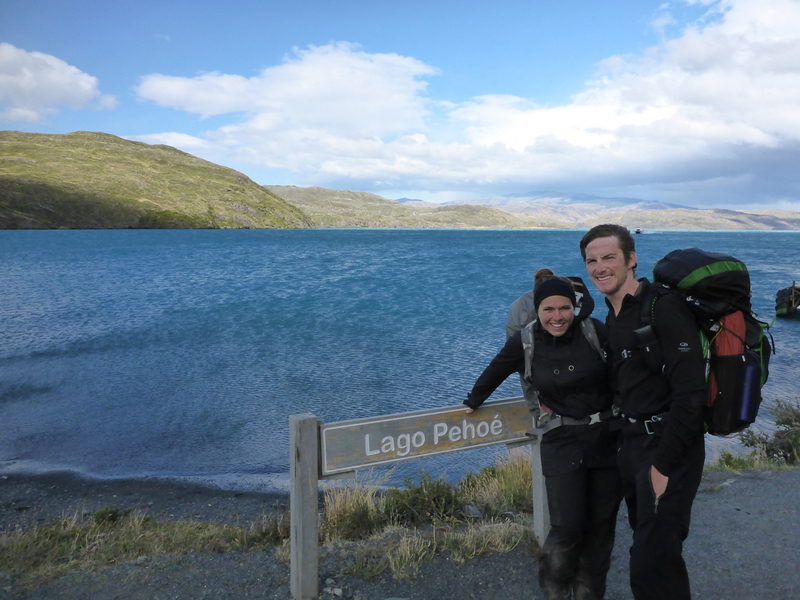 We had a quick celebratory huge with them then saw the boat coming across Lago Pehoé. 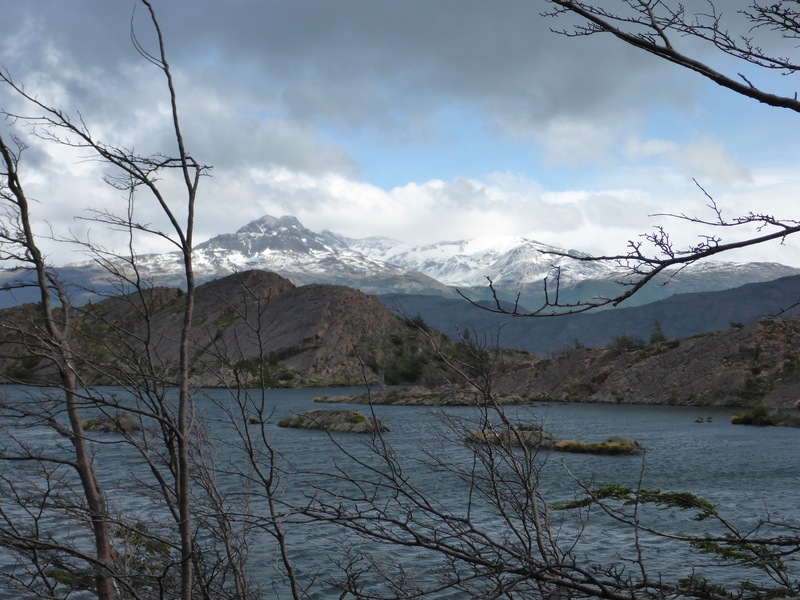 We could catch the boat and the bus back to Puerto Natales and be at Erratic Rock by dinner! 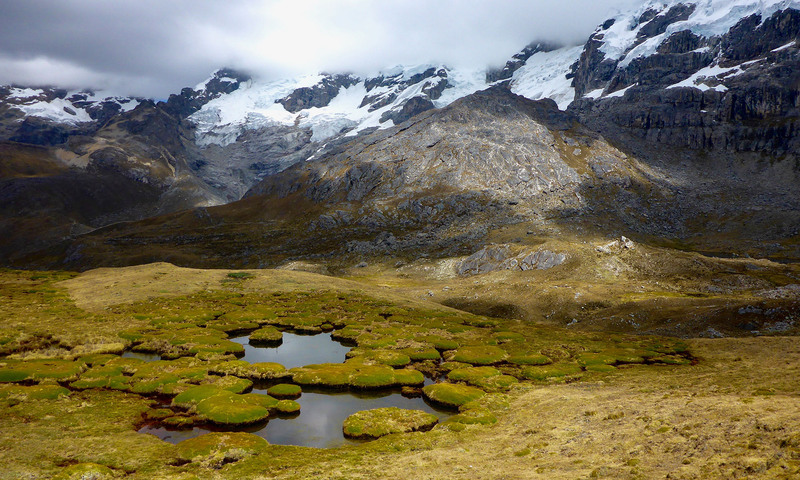 It was a no brainer once we realized that camping at Paine Grande is almost as much as a stay at the hostel and the hostel comes with hot showers and an amazing breakfast. We savored our “well deserved” beers as the boat made it’s way across the lake then found our bus and a few hours later we walked into Erratic Rock a day early! Just found this post, missed it last week. Wow! I’m exhausted from just reading it. where is Liz going to get new h/boots? 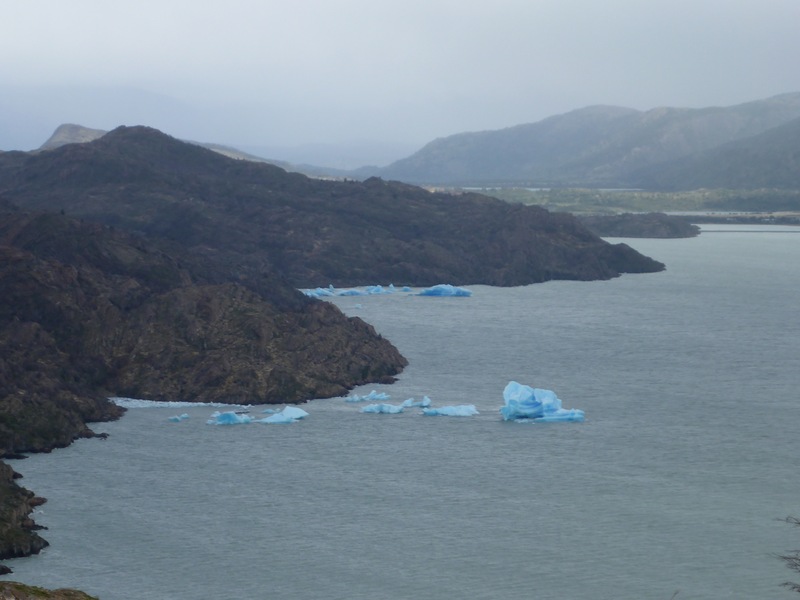 We got her a new pair in Puerto Natales… they are less than ideal, but pretty much the only option down there. We’re hoping to upgrade them if we can find some good ones at a reasonable price.